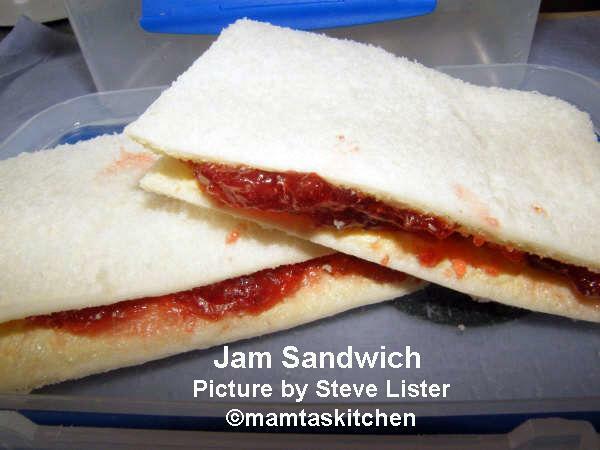 A sandwich is basically two slices of bread with a filling. It is said that the Earls of Sandwich, a town in Kent in UK, was a gambler. He did not like to have his game interrupted to eat food. So, he asked his cooks to serve meat, cheese and other food ingredients, packed between to slices of bread, so he could eat food without stopping his game and sandwich was born! Bread has been eaten with meats, cheeses or other toppings for centuries. In different parts of the world, people have always eaten various fillings, placed between their own type of breads. Even Frankies, the Indian chapatti rolls, Tortillas and fajitas come into this category. Sandwiches fillings given here include ideas collected in response to my question about 'some of the best sandwich fillings people have ever had' on BBC board and from family and friends. Asparagus: Asparagus tips, cooked, cooled and rolled in thin, buttered slices of bread-Neeta Gupta. 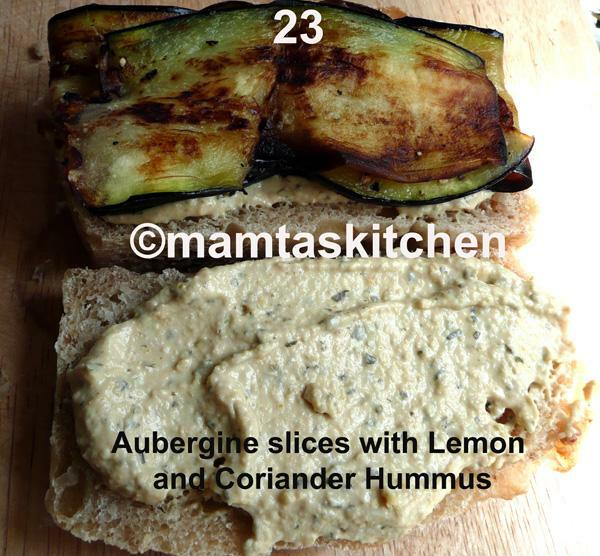 Aubergine: Curried Aubergines or Aubergine Mash in a fresh bread roll. You can add sliced onions for extra crunch. Aubergines:Pan Fried Aubergine slices in a buttered bread roll/bread slices. You can spread a thick layer of Hummus instead of butter, picture 23. Avocado: Avocado slices and mayonnaise, with salt and pepper. You can add watercress or rocket salad. Avocado: Avocado and Marmite, on toasted bread, 'my current quick favourite' - Ruth Stevens from BBC food message board. Chives: fresh white bread with salted butter and chopped chives (or spring onion greens) - Kathy Q. from BBC Food message board. 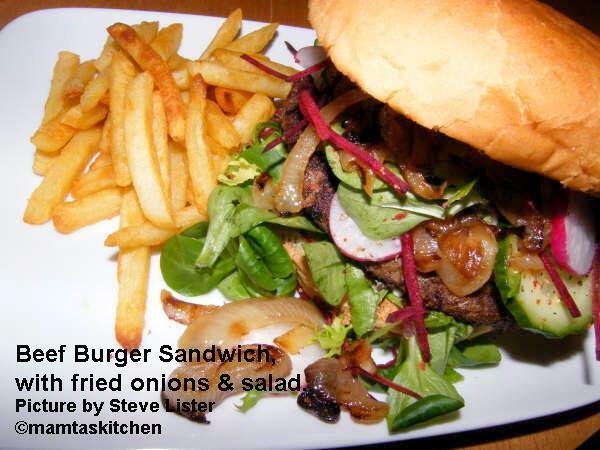 Garlic, Onion & Tomato: Garlic, finely sliced red onion rings, sliced tomatoes & watercress- serve with crisp radishes-Alison Wright from BBC Food Message Boards. Gherkins & Tomatoes: Tomato and dill cornichons (pickled gherkins) on rye bread - Fi Diggory from BBC food message board. Hummus with red onion rings and sliced tomatoes, on any fresh bread of choice, including pitta bread or Nan. Hummus, mixed with chopped black olives and red onions, between 2 slices of any fresh bread. Peanut butter on white bread, served with a glass of chilled milk or a milk shake. PIZZA topping: Place any chosen Pizza toppings on a toast/split bread roll. Grill until cheese is bubbling. Potato bhaji with Green Mango Chutney: - Mayank Kumar from Delhi in India. 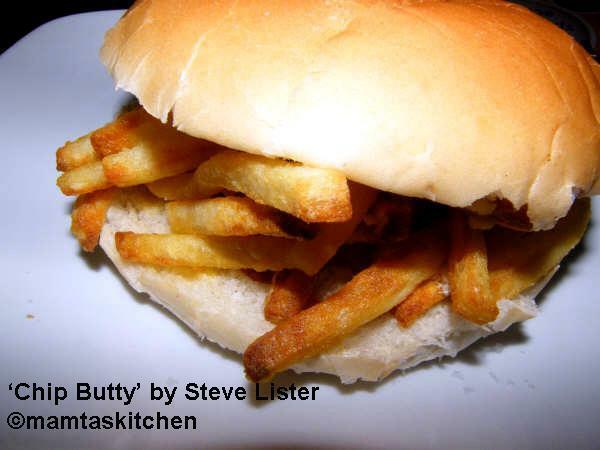 Potato crisps on sliced white bread, 'a life-long passion'. Ruth Stevens - from BBC food message board. Potato cutlet or Aloo Tikki, withGreen Mango Chutney - Mayank Kumar from Delhi. Roast Vegetables (green peppers, aubergines, tomatoes) roasted in olive oil Mediterranean style, salt and pepper, with or without cream cheese. - Neeta Gupta. Spicy salad & Cream cheese: Chopped red onion, tomato, green chilli, mixed with 1 tsp. cream cheese, salt and pepper to taste. 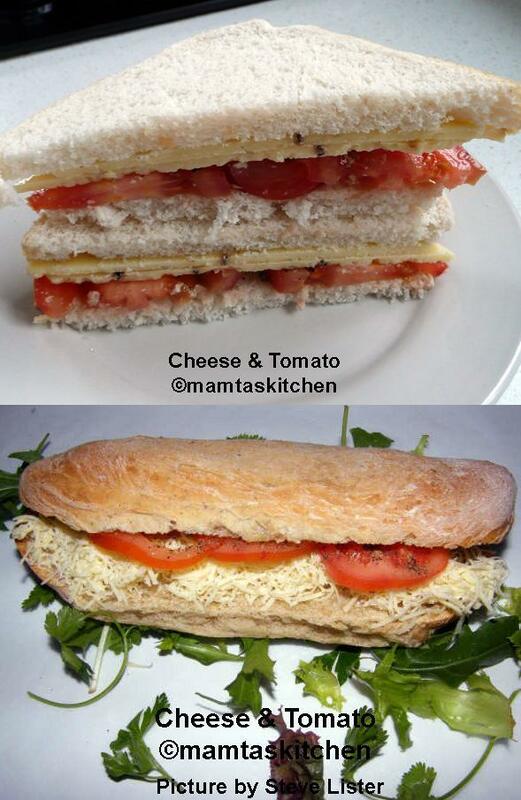 Make the sandwich not too long before eating. 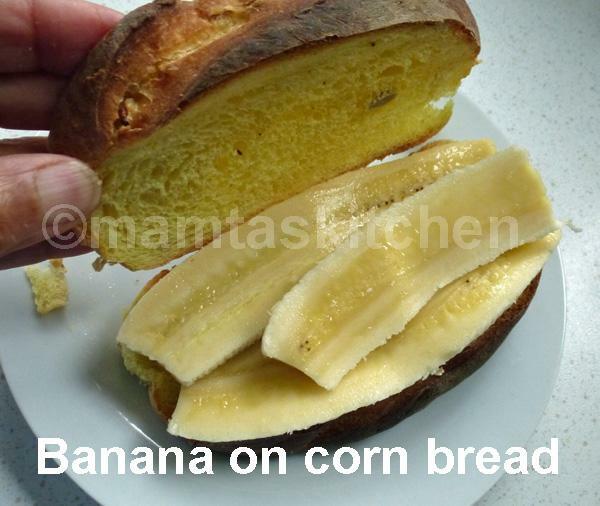 use any good white bread - Mitun Gupta from Switzerland. Tomatoes and Mozzarella Cheese: Ciabatta bread roll, filled with mozzarella, tomato slices and fresh basil leaves- Hilary Ougham from BBC food message board. Vegetable Bhaji: any leftover bhaji (a dry vegetable curry) + onion slices + tomato ketchup or Green Mango Chutney - Mayank Kumar from Delhi, India. Vegetable Fritters or Pakora like Onion Bhaji , with Green Mango Chutney. Brie cheese & grapes: soft, ripe Brie, halved seedless grapes, torn up basil leaves & black pepper. 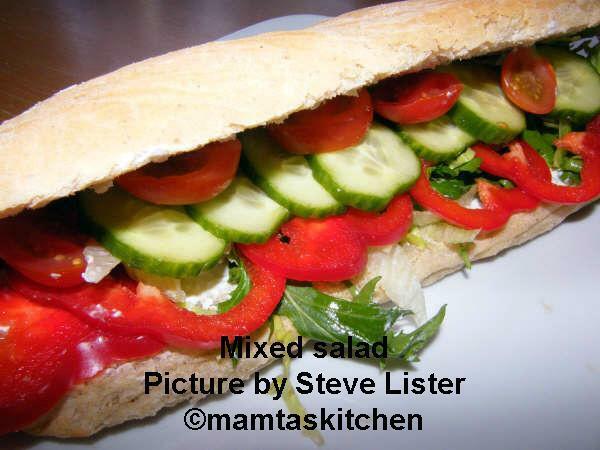 It is best in a baguette - Alison Wright from BBC Food Message Boards. Brie cheese with maple cured bacon, rocket, spicy tomato chutney and mayonnaise on granary bread - someone (name delete by mistake) from BBC Food Message Boards. 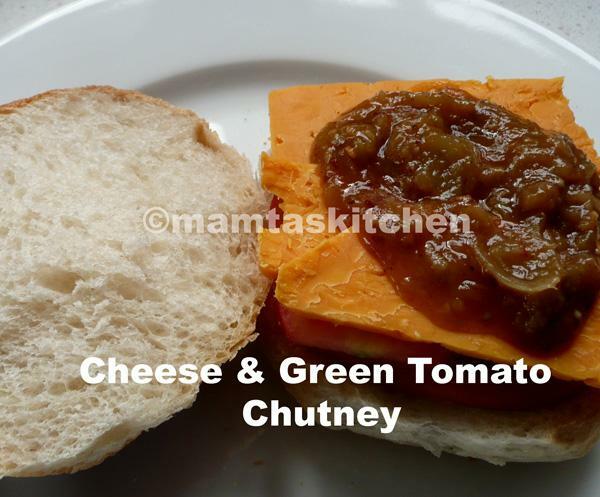 Cheddar or other sliced cheese and Green Mango Chutney or Green Tomato Chutney (picture 21) or Branston pickle or a relish or pickle of your choice. Cheddar Cheese & Salad: Cheddar cheese, onion & finely grated carrot, blended to a spreadable paste, mixed with mayonnaise or salad cream. Sprinkle salt and pepper to taste-Alison Wright from BBC Food Message Boards. Cheese of choice: Any good cheese on any good quality fresh, buttered bread - Neeta Gupta. Cheese and Beetroot: Grated/sliced cheese and grated/sliced beetroot on buttered bread. You can add a little mayonnaise, if you wish. Cream Cheese: Cream cheese mixed with chopped pineapple or tomatoes or watercress or corn or red pepper or red onions. Add freshly ground black pepper-Sally from BBC Food Message Boards. 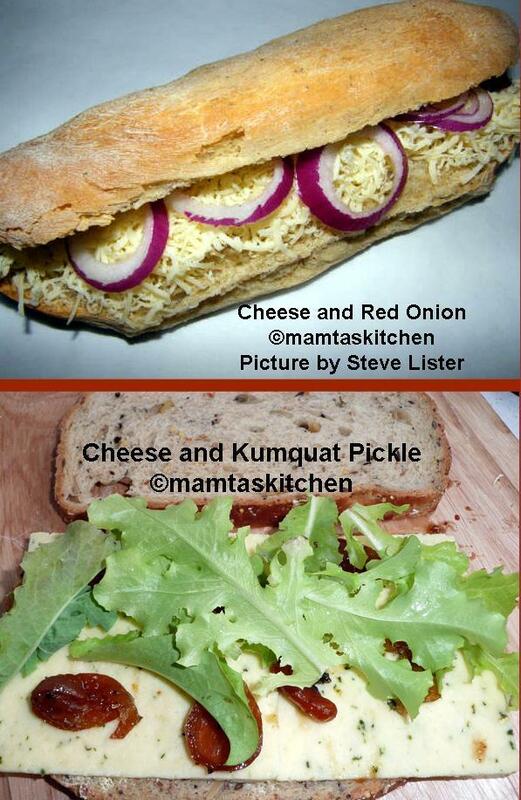 Emmental Cheese: Emmental cheese with spicy red pesto (deli kind, rather than bottled one) and salad, on a fresh baguette - Antonia Parkin from BBC food message board. 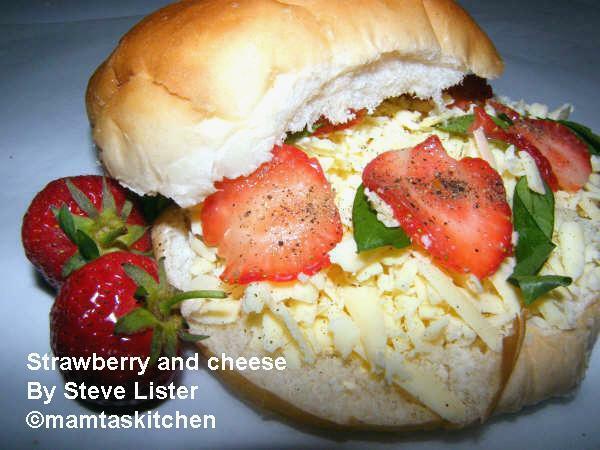 Goat's Cheese with tomatoes , on fresh bread - Liz from BBC food message board. Goat's or Wensleydale Cheese, crumbled, Roasted Green peppers and Onion marmalade. megsinmcc from BBC Message Boards. Mozzarella Cheese, sliced tomatoes and fresh basil leaves , on Ciabatta bread roll - Hilary Ougham from BBC food message board. Egg & Bacon: Between 2 slices, with one side of the bread toasted,"I prefer the inside toasted and lots of black pepper." - Tim Elkington from BBC food message board. Egg: Hard boiled & chopped eggs, mixed with equal amount of grated cheddar and bound with tomato sauce and salad cream. Egg: Hard boiled eggs, mashed with salad cream and lots of cress on top - Kathy Q from BBC message board & Neeta Gupta. Egg: Hard boiled eggs, finely chopped up and mixed with de-seeded chopped tomatoes, salt, lots of black pepper & a good dollop of salad cream (NOT mayonnaise) - Alison Wright from BBC message boards. Egg & Mayonnaise: Hard boiled egg, chopped and mixed with mayonnaise, on soft white bread rolls, seasoned with lots of black pepper - Fi Diggory from BBC food message board. Egg & Salad: Hard boiled eggs, chopped, on brown buttered bread, topped with lettuce, sliced tomatoes and a dab of salad cream! - Norman Askew from BBC food message board. Fruit: Any fresh fruits sliced and layered on a buttered, fresh bread or toast. Bacon and Watercress: lots of crisp bacon and watercress or lettuce, between two thick slices of buttered bread. You can also have a BLT; Bacon Lettuce and Tomato slices, on fresh bread. Beef, corned beef:, crumbled up and mixed with grated onion, salt, pepper & chopped up tomato flesh (remove all the watery seeds) - Alison Wright from BBC Food Message Boards. Beef with sliced beet root: Cold roast beef slices and beetroot slices, with or without mayonnaise or with horse radish sauce. Beef: Roast beef and SautÃ© onions: SautÃ© chopped onions until deeply golden, add slices/chunks of leftover roast beef, along with some gravy, heat until piping hot and serve over a hot, crisped up baguette spread with horseradish/mustard. 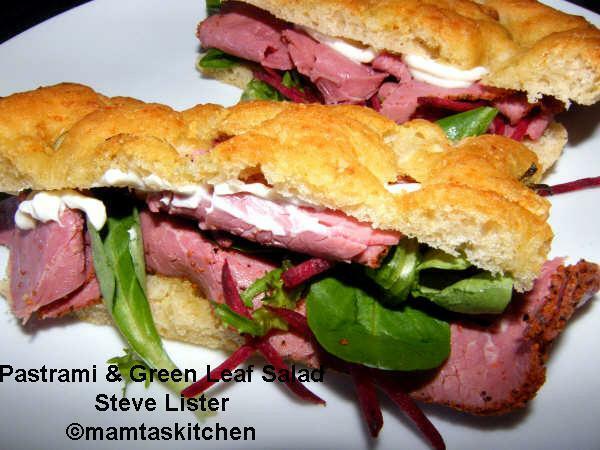 Beef, cold, roast beef slices and rocket salad /cress/lettuce, with or without mustard and horseradish sauce - Neeta Gupta. Cured (cold) meat slices like ham, beef, chicken, pork, salami, pepperoni etc., with onion rings, cress, mayonnaise, on any good quality, buttered bread/bread roll. 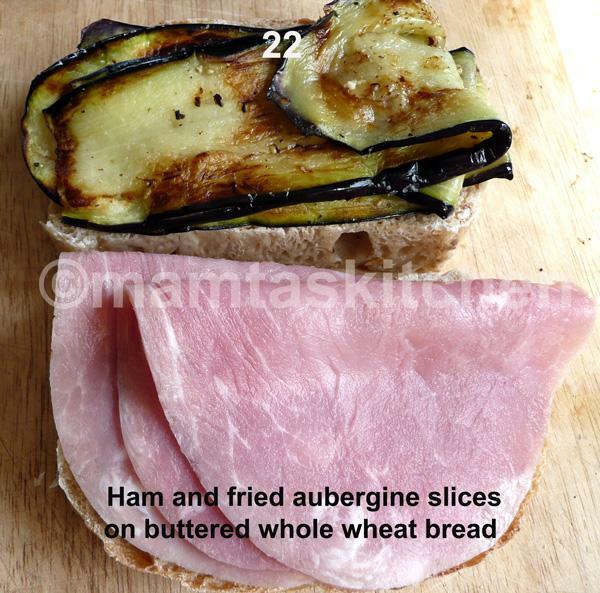 Ham and Aubergine slices on freshly buttered bread slices, salt and pepper, picture 22. Ham slices, with potato crisps - Kathy Q from BBC food message board. Ham, Lettuce and Tomato, with butter and mustard, on any good bread. See picture 6 and 13. 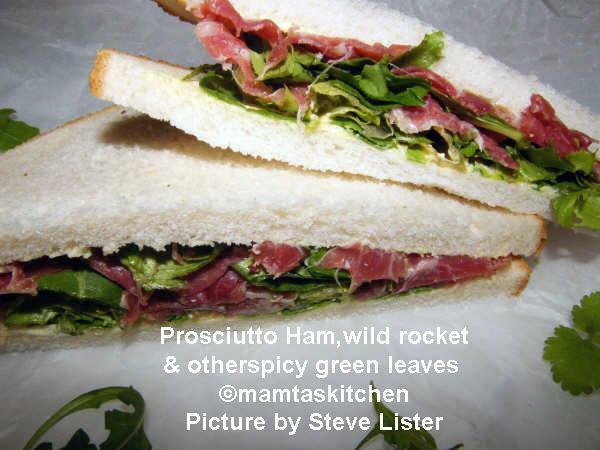 Ham, Cheese and Wild Rocket Salad: 'I have it growing as a weed in my garden!! Delicious!!' - Lindsay Freeman from BBC food message board. Ham, Chicken and Salad: Pan fried strips of chicken breast, Parma ham, a little each of shredded iceberg lettuce, sun blush tomatoes, marinated artichoke hearts (chopped), sliced tomatoes, shavings of parmesan cheese & mayonnaise on Pitta bread. Ham & Mayonnaise: Cold ham, chopped & bound with mayonnaise, mixed with chopped garlic, served on white bread-Andrew Taylor, past chef-proprietor, Crumplehorn inn Cornwall, now chef-manager, BA 1st/Business Lounge at Toronto Pearson Airport. 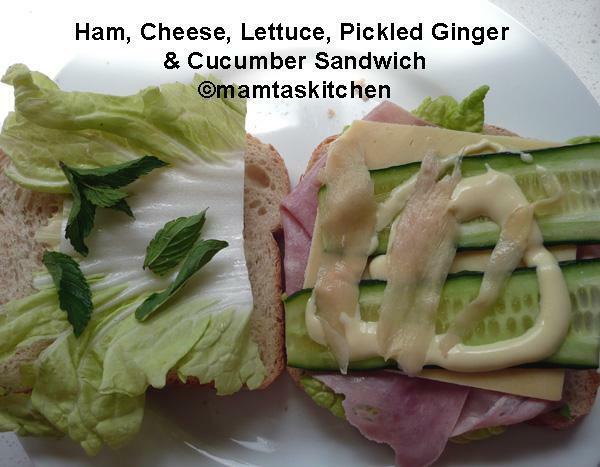 & Cucumber Sandwich, Picture 18. 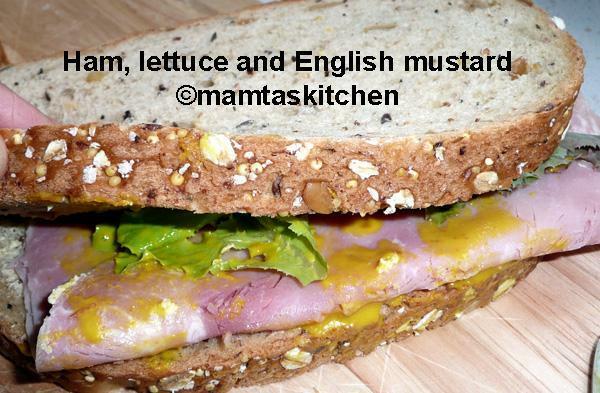 You can make it without Ham, as a vegetarian sandwich. 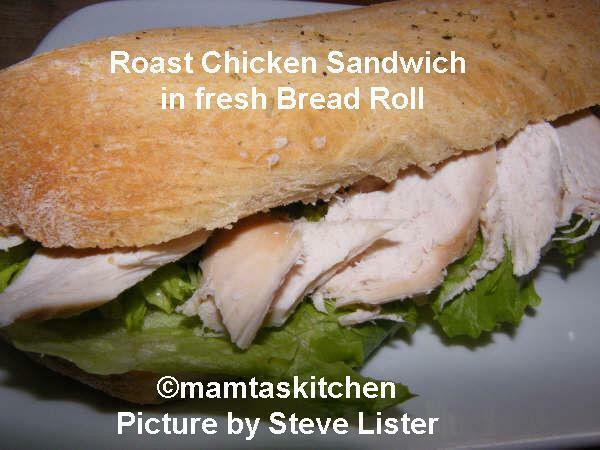 Leftover roast or bought meats/chicken, cold, mixed with mayonnaise, mint sauce or cranberry sauce or mustard. Pastrami with cream cheese, seasoned with lots of black pepper - Fi Diggory from BBC food message board. Salami, mozzarella cheese, roast vegetables & basil: salami slices, topped with roasted red peppers, torn up mozzarella cheese, crispy fried onion (you can buy pre-fried onions from the most supermarkets or Indian grocers). Sausage: Leftover pork & leek sausages cut into halves, mustard, mayonnaise & a dollop of apple sauce, on in a crusty bap (bread roll) - Alison Wright from BBC food message board. Sausage: Slices of garlic sausage, with a layer of coleslaw, between two slices of any good bread. Alison Wright from BBC food message board. Sausage: Cooked, cooled and sliced sausages of choice, with tomato ketchup, lined between two slices of any good bread - Janey. 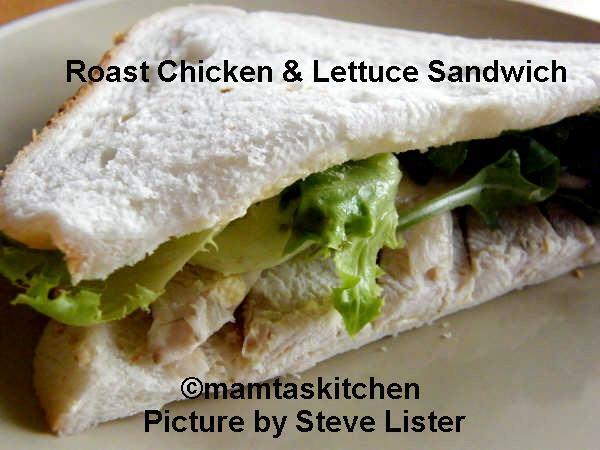 Chicken Mayonnaise Salad:, made with roast chicken, good mayonnaise or low fat salad dressing, preferably on thick granary bread slices, cut into real doorstep thick chunks, with loads of salad leaves of choice. Chicken, Avocado and Tomato: Cold cooked chicken, sliced avocado and semi-sun dried tomatoes, on a good bread. "It is just heaven!!" - Annie H. BBC food message board. Chicken Curry Crunch: Spread mango chutney thinly over bread (no butter needed), cover with iceberg lettuce and plain chicken breast meat (cooked), mixed with curry mayonnaise. Yum! scalywitch (Carol) from BBC Food message boards. Chicken-Roast. See picture 1 & 2: Cooked chicken slices, on a thick layer of lettuce leaves of one sort or other. 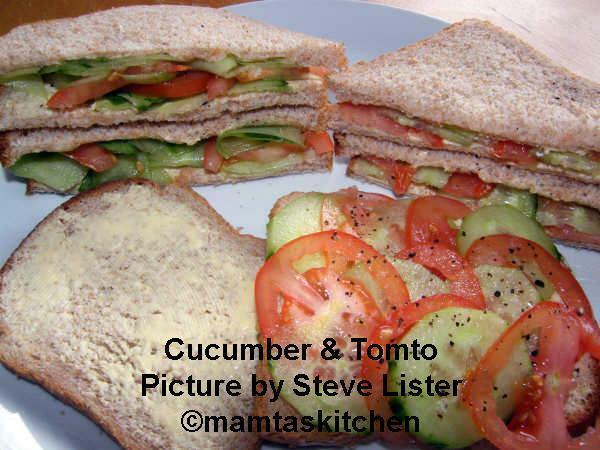 Spread a salad dressing layer on the bread, in place of butter or margarine - Mamta. Chicken Tandoori: on a slit Nan, with shredded lettuce and Green Mango Chutney. Chicken Tarragon: Cold roast chicken-sliced, natural yoghurt and chopped tarragon leaves, on a granary bread/roll. Use generous amounts of chicken and tarragon. Reynard Dargent from BBC food message boards. Chicken Tikka slices , with a layer of Green Mango Chutney and lettuce, between slices of any good bread. Duck: Sliced roast duck and cranberry sauce. Duck:Sliced roast duck meat, shredded and mixed with Hoi sin/Plum sauce, spring onions, a sprinkle of sesame seeds. Serve with cucumber batons (fingers) & spring onion 'curls' - Alison Wright from BBC Food Message Boards. 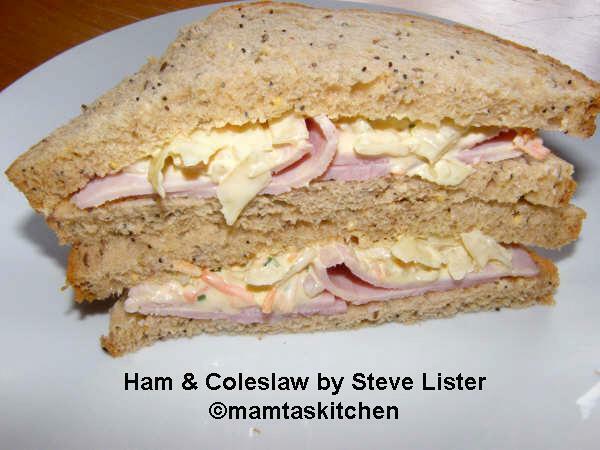 Turkey or Ham; A good post Christmas sandwich is leftover chopped up boiled ham or turkey in a light mayonnaise, with slices of stuffing and cranberry sauce, layered between any good bread! 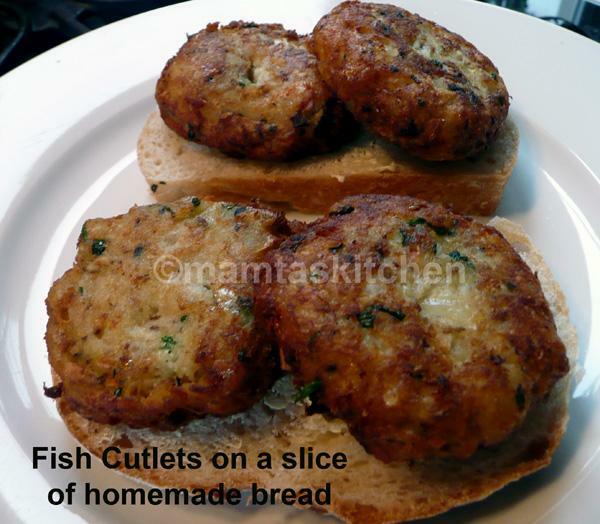 Crab & Mayonnaise: White crab meat with mayonnaise or seafood dressing (mix mayonnaise, tomato sauce, chilli sauce), with or without cucumber slices/onion rings, on any good bread or bread roll - Mamta. Smoked Mackerel salad 2 on slices of fresh bread. Smoked Mackerel Salad 3, served on a good granary bread. Andrew Taylor, past chef-proprietor, Crumplehorn inn Cornwall, now chef-manager, BA 1st/Business Lounge at Toronto Pearson Airport. Smoked Salmon with Dill on bagel: Fresh bagel filled with smoked salmon, lemon juice and dill weed, served with an ice cold white beer - Hilary Ougham from BBC food message board. Smoked Salmon & Cream Cheese on bread: cream cheese and a generous amount of salmon on granary bread, seasoned with lots of black pepper - Fi Diggory from BBC food message board & Neeta Gupta. 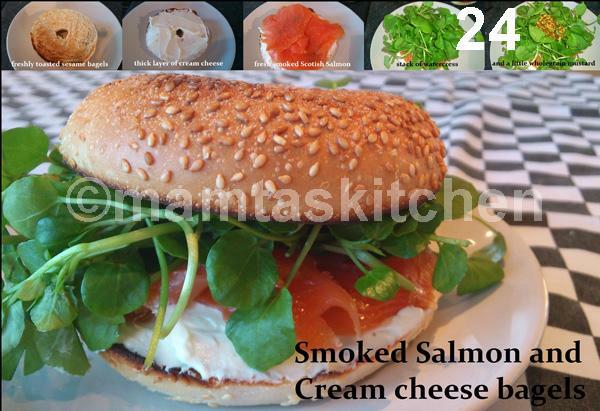 Smoked salmon, cream cheese and cress on a toasted sesame bagel: Spread bagel with a thick layer of cream cheese, top with fresh Scottish smoked salmon and then a big bunch of watercress giving it peppery notes. Tinned Red Salmon: drained & flaked, mixed with cottage cheese, shredded spring onion, chopped fresh dill & a sprinkle of salt and pepper - Alison Wright from BBC food message board. Use the best ingredients that you can find, including a very fresh and good quality bread. 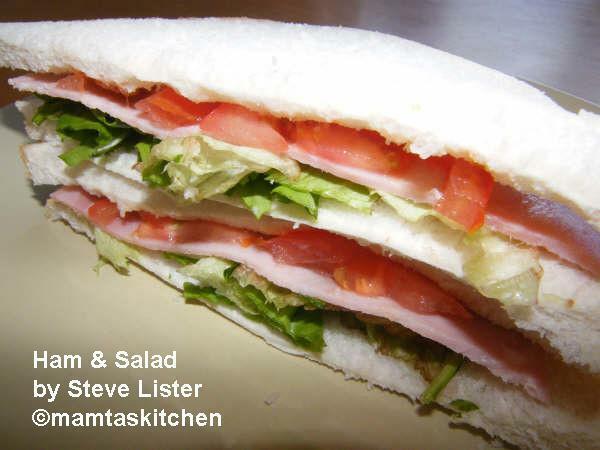 Sandwich taste best when made with fresh, good quality ingredients. Whether you use white, brown, whole-wheat, home made or speciality breads or bread rolls, it is your choice. Whether you use butter or margarine or salad cream or nothing on the bread, it is your choice. Use generous amount of filling. Removing crust or not is also your choice. You can cut each sandwich into smaller squares or triangles if you wish. It makes it easier to eat at buffets. Unless eating immediately, cover them tightly in cling film or aluminium foil. Names of a few contributors were lost during posting. If a line becomes too long, the programme deletes it automatically. If you see your recipe idea here, with ? contributor written against it, please let me know.